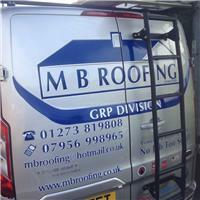 M B Roofing Ltd (Brighton) - Fascia/Soffits/Guttering, Roofer, Weather Coatings based in Coldean, East Sussex. Invoice history based on 701 reviews. MB ROOFING BRIGHTON are a locally run family company that was set up and run by myself, Mike Bishop, 30 years ago. We are one of Brighton & Hove's leading local roofing firms, specialising in domestic roofing repairs and replacements. We have worked on nearly every type of roof detail in Sussex. I personally come out and price 99% of all jobs, carrying out all administration from answering the phone and doing all quotes, invoicing, overseeing work and still actively getting involved when needed. We have a fleet of 4 new sign written vans that can been seen in and around the East Sussex area daily. We offer a truly personal service and treat you and your property as we would expect ours to be treated. We do not employ sub contractors. We now carry out drone surveys free of charge. Flat Roofs ~GRP firbeglass approved contractors- Lead work ~ Tiling - Firewalls ~ Chimneys ~ All Roof Repairs ~ Fascia Boards, Guttering ~ Velux Windows ~ 1 Tile or Complete Roof ~ No job too small. FMB and Trustmark approved contractor. Brighton & Hove Trading Standards Approved Contractor. Free Estimates. We carry £10 million Employers Liability Insurance and £2 million Public Liability Insurance including use of heat.we now offer a full state of the art Drone survey free of charge, what ever the height or access we can guarantee close up aerial shots and instant close up views of all your roofing problems.